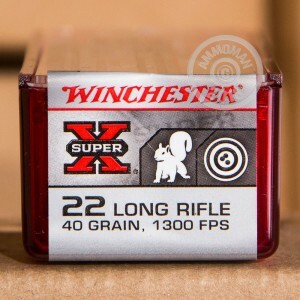 Winchester's Super-X line of 22 LR is a high velocity round proven to be accurate and reliable. These cartridges fire at 1300 feet per second and are loaded with a copper plated round nose, 40 grain projectile. 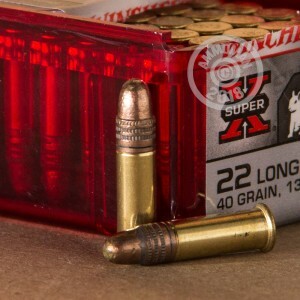 The 22 LR caliber is extremely popular and perfect target shooting, small varmits or plinking. 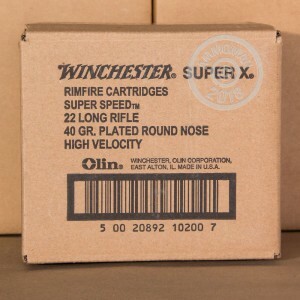 This ammo is new production, rimfire, and brass cased. Winchester is one of the most respected brands in the industry and has been producing firearms and ammunition for over 140 years. They are known for manufacturing a high quality product and supply to both consumers as well as the US military. AmmoMan.com offers Free Shipping on all orders over $99!